and the Grim Reaper, a dark figure that players manipulate against each other. Other products in the "Talisman" series. This is the ultimate small add-on for Talisman 4th edition by Fantasy Flight Games. 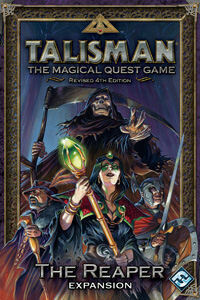 The additional spells, adventure cards, and characters are all must-haves for the serious Talisman enthusiast. In addition, this small box includes the optional non-player "Reaper" character, who completely revamps the spirit of maliciousness that so many people enjoy in this game. If you are to buy just one expansion to your base game, make this one be the first you buy. A close second place finisher would be the Talisman expansion "Blood Moon."